Member of the Foreign Service of Pakistan in1984. Assumed charge as Foreign Secretary on 20 March 2017. 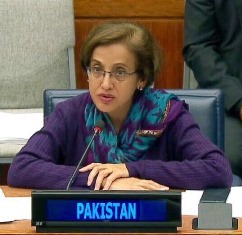 At Pakistan's Missions Abroad, Ms. Tehmina Janjua served as: Permanent Representative of Pakistan to the United Nations and Other International Organizations, Geneva (October 2015 - March 2017); Ambassador of Pakistan to Italy (concurrently accredited to Albania, San Marino, Slovenia, FAO, IFAD and WFP) (2011-2015); Deputy Permanent Representative of Pakistan to the United Nations and Other International Organizations, Geneva (2005-2009); Counsellor Pakistan Mission to the United Nations and Other International Organizations, Geneva (1996-2000); and Second Secretary/First Secretary, Permanent Mission of Pakistan to the United Nations, New York (1990-1995). She served as the Spokesperson of the Ministry of Foreign Affairs, Islamabad in 2011. At the Ministry of Foreign Affairs, Islamabad, Ms. Tehmina Janjua has served as: Director General (Strategic Planning), Foreign Secretary's Office (2009 to 2011); Director Foreign Secretary's Office (2004-2005); Director Minister of State for Foreign Affairs' Office (2000); Director Foreign Secretary's Office (1995-1996); Acting Director of the Office of the National Security Adviser (1989); and Desk Officer, Soviet Union and Eastern Europe, Foreign Office (1986-1987). Holds Masters in International Relations (M.I.A) degree from School of International and Public Affairs (SIPA), Columbia University and Literature, Quaid-e-Azam University, Islamabad (1983). Married to Syed Mansur Raza.